Our faculty members are passionate about what they do, and masters of their content areas. They carefully design curriculum to push each student to their maximum potential, while expanding their educational opportunities both in and out of the classroom, preparing them for a world driven by exponential change. The majority of our faculty members have chosen not only to teach at Storm King, but also to call Storm King their home. Some 65 percent of teachers and staff live on campus, and those who don’t live on-site still share meals with students, coach sports teams, lead co-curricular activities, and build relationships with their students that extend beyond the classroom. Our School community fosters a unique connection between students and teachers, making learning less of an academic pursuit and more a part of real life. Discussions that begin during class continue in the dining hall, on the playing field, and in the dormitory. Because Storm King teachers come to know the whole person, not just the student they see in class, they are able to advise students on a more personal level. Students, in turn, see their teachers as adults they can trust, not just the people who administer their tests. The College Counseling Program at Storm King has a reputation for finding colleges and universities that best match each student’s talents, interests, and aspirations. Our college counselors work one-on-one with each student and their family to identify the student’s wants and needs, and then guide them into a position of strength where they can choose the college or university that is their best fit. The results of this personalized college counseling process are impressive. Every one of our students is accepted into college while 90% of seniors are admitted to one or more of their top three college choices. One of the greatest assets of The Storm King School is our close proximity to New York City. Imagine, you could be having breakfast in the campus dining hall, hop into a school van for a meeting with some of the world’s top experts in Manhattan, and return in time for afternoon activities. Recently, our students traveled to the House of Louis Vuitton for a private tour of the luxury brand’s newest exhibit. Meetings with Wall Street executives are always favored by our economics students. Another recent hands-on excursion brought our students all the way to the 82nd floor of the World Trade Center for a session with media experts at Mic.com. At SKS, you’re always only 55 miles away from everything New York City has to offer. At Storm King, not only can you choose among classes in the core disciplines but also in interest areas not typically offered at other secondary institutions such as fashion design, computer science, literary arts, and environmental science. You will choose your own path, and you will graduate with all the required credits for college, plus a wealth of knowledge in other areas that interest you. Our world is changing at a rapid pace and today’s students must prepare for jobs that do not yet exist, in fields that have not yet been imagined. To ensure that Storm King students graduate with a competitive edge, ready and eager to thrive in the 21st-century economy, we help them become thinkers, doers, problem solvers, and adapters. We emphasize CREATIVITY, COLLABORATION, CRITICAL THINKING, and COMMUNICATION throughout our curriculum. With approximately 100 courses, including AP and Honors level subjects, Storm King students have the opportunity to design a schedule that allows them to explore their particular interests and passions. Storm King encourages students to take advantage of its numerous academic and service learning offerings, which include our Signature Programs such as Q-terms, Capstones, Cornerstones, travel abroad, and extensive service-learning opportunities both on and off campus. You will gain new knowledge and skills through real-world environments. If you are looking for a school where all you do is sit in a classroom and listen to lectures, we’re sorry, this may not be the right place for you. As a student-athlete at Storm King, you’ll have the opportunity to compete in 19 different sports and activities at the varsity, junior varsity, and club level. Whether you are a seasoned athlete or just starting out, there’s an opportunity for every student to get involved. Whether you are competing at a high level or exploring something new, you’ll spend invaluable time with your teammates, make new friendships, and create lifelong memories. 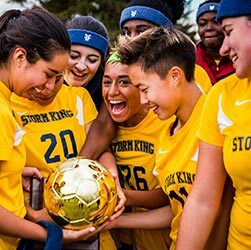 At the same time you’ll personify Storm King’s core values of ‘Truth, Respect, and Responsibility’ on and off the playing field. Our renowned arts program boasts an accomplished faculty, state-of-the-art technology, and a broad selection of inspiring and stimulating courses including Studio Art, Ceramics, Photography, Filmmaking, Fashion Design, music, dance, theater, and much more. Storm King students enjoy superb facilities which include the 230-seat Walter Reade Jr. Theatre, the Allison Vladimir Art Center, and first-class instruction from a faculty that includes noted contemporary artists. Our close proximity to New York City enables our students to experience world-renown performers, Broadway shows, and even the eccentric Mercedes-Benz Fashion Show. Our art program allows beginners to tap wellsprings of creativity they might never have realized they possessed, while challenging our artistically gifted students to make the leap from good to great. Storm King student-artists attract the attention of some of the world’s top arts colleges including RISD, Parsons, FIT, Pratt, and many others. Exposure to diverse cultures in a caring environment fosters tolerance and allows our students appreciate cultural differences — values that are essential for their future achievements. We are proud of the fact that we prepare our students to lead productive lives in the global community. 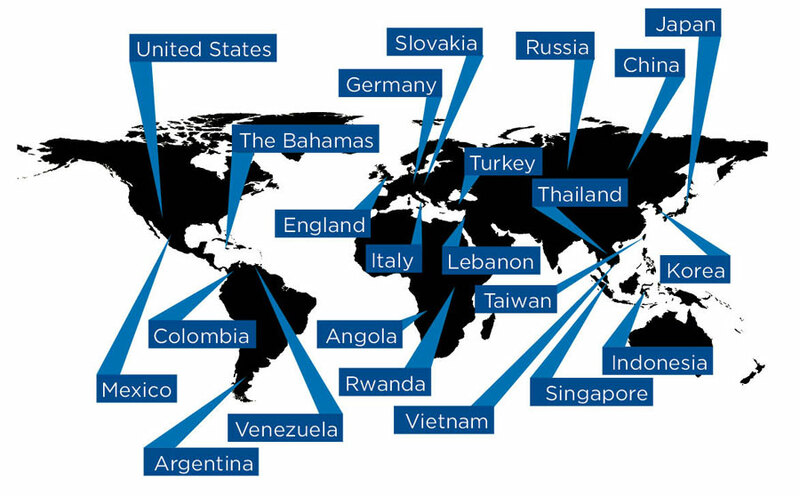 About 45% of our student population is international, hailing from Angola, Argentina, Bahamas, Colombia, China, Germany, Japan, Korea, Lebanon, Mexico, Malaysia, Russia, Slovakia, Spain, Taiwan, Thailand, Turkey, France, Vietnam and beyond. International or domestic, day student or boarder, artist or athlete — we celebrate the diversity of our school and cherish the inclusive spectrum of interests and talents among our students and faculty. The beauty of our campus will inspire you, as it has inspired our students since 1867. Our 51 beautiful acres include mountains, forests, hiking trails, landscaped grounds, and thousands of trees. Our rolling lawns dotted with a mixture of historic and contemporary buildings give the campus a quintessential New York charm, while our facilities provide all the modern amenities and comforts of home that you expect as you pursue your dreams. If there is one thing you will always remember about your life at Storm King, it’s our food! We take pride in the quality and variety of food served in our dining hall and our students, faculty, and alumni agree. That’s because our chefs and staff work diligently to provide the best choices for our diners’ overall health, special dietary needs, and the environment. A large portion of our meats, dairy products, and produce are organic and sourced locally, and our eggs are cage-free. We know what you like and care about what you eat. Get a closer look at the SKS Experience by selecting an image below!